Having friends is great. Having more friends is better. Sometimes, those friends aren’t already on your tablet and require building a new contact from scratch on your Nexus. Keeping all those friends is best. In the People app, myriad ways are available to add more friends or create new contacts. Touch the Add Contact button. 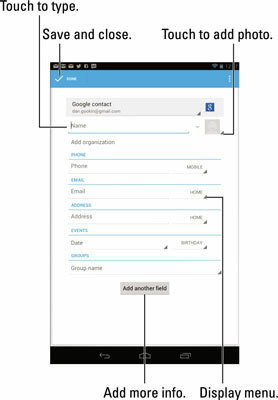 If you don’t see the button, ensure that All Contacts is chosen from the Contact Groups menu. If prompted, choose your Google account from the menu. It is recommended that you create new contacts by using Google because it synchronizes the information with the Internet and any other Android gizmos you may own. Fill in the information on the New Contact screen as best you can. Fill in the text fields with the information you know. Touching a field pops up the onscreen keyboard. Use the Menu button (shown in the margin) to choose options for various items. For example, you can touch the Menu button by the Phone item to select whether the number is a mobile, work, or home number, for example. To add a second phone number or an e-mail address or a physical address — or any other item — touch the Add New text that appears. To remove an additional item, touch the X button that appears next to the item. Touch the Done button to complete your editing and add the new contact. Or to cancel the creation of a new contact, touch the Menu button in the upper-right corner of the screen. Choose the Discard command. New contacts are automatically synced with your Google account. That’s one beauty of the Android operating system, used by the Nexus 7: You have no need to duplicate your efforts. Contacts you create on the tablet are instantly updated with your Google account on the Internet.